The South African city has topped Global Water Intelligence’s annual listing of the largest water tariff increases in 2018 with a 390% increase in the benchmark price of water and wastewater services. Overall the global average price of water and wastewater rose by 3.8% to $2.04, held down by price cuts in Northern Europe and cities in Africa and the Middle East choosing not to increase rates. The results were released in a new white paper entitled The Global Value of Water, published by GWI in partnership with Arup and The Global Water Leaders Group (GWLG), and featuring analysis and commentaries on The Global Water Tariff Survey 2018. 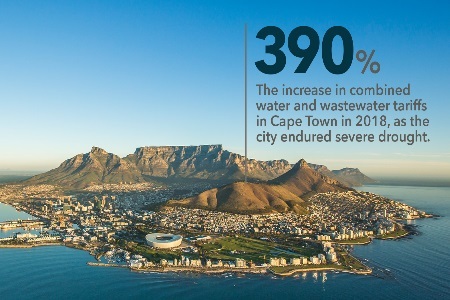 The 2018 survey is the most extensive yet carried out by GWI, calculating changes to the price of urban water and wastewater in 512 cities across 191 countries, based on a benchmark of an urban household of four using 15 m3/month. The white paper documents how Cape Town’s tariff hike aimed to penalise households using more than 6m3/month as water levels in the dams serving the city fell below 35%. This measure helped cut peak water usage in the city by 54% and Day Zero – the day the city ran out of water – never came. With dams refilling, tariffs are now adjusted downwards.